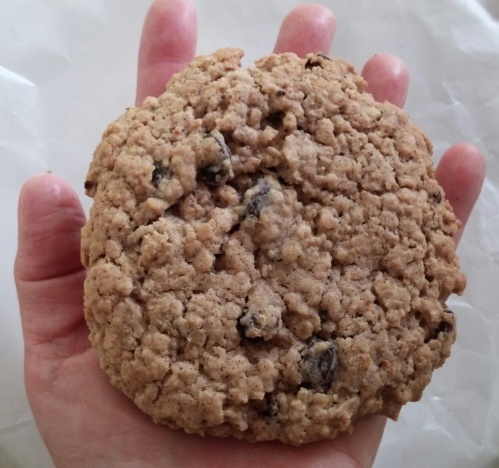 Jumbo Oatmeal Cookies are perfect for large gatherings, picnics, bake sales, and cookie gift baskets. You can make them to be the size of the palm of your hand, about 4 to 6 inches across. Combine flour, baking soda, and cinnamon in a medium bowl. Set aside. In a separate bowl, using an electric mixer on medium speed, cream butter and brown sugar until light and fluffy, scraping the bowl continually. Beat in eggs, one at a time. Stir in vanilla extract. Gradually stir flour mixture into creamed mixture a bit at a time until well blended and smooth. Add oatmeal, a bit at a time. The dough will be thick. Add raisins to the dough, mixing them in with a wooden spoon until blended. Pack a ¼ cup measure with dough. Drop measured dough onto prepared baking sheets, 6 per sheet. With water, lightly mist the bottom of a 6-8 inch dinner plate (or other flat-surfaced dish). Flatten each cookie gently with misted dish. Bake cookies 13-15 minutes until they are light brown around the edges and appear to have no moisture peeking through crackled tops. Remove cookie sheets from the oven. Jumbo Oatmeal Cookies need plenty of cooling time. They will become more and more firm as they cool. If you remove them from the baking sheets too soon, the cookies may break apart. Let cookies sit on baking sheets until you can safely lift them with a spatula and transfer them to cooling racks without cracking the tops. Use several baking sheets. Because these cookies take longer to bake than most drop cookies and longer than most to become firm, you will save time by rotating batches of cookies in and out of the oven and throughout the cooling process.